John Dorney looks at the burning of the Big Houses in the Irish Revolution of 1919-23. Late on January 29, 1923, Lady Mayo was eating dinner with her husband, Lord Mayo, at their palatial home, Palmerstown house, in the Kildare countryside. Times were unsettled; civil war was still fitfully raging between the anti-Treaty guerrillas of the IRA and the troops of the Irish Free State government. In an effort to stamp out the guerrillas’ will to resist, the Government had embarked on a policy of widespread executions. That day, six IRA men had been shot by firing squad at the military base at the Curragh. Out of the darkness of the country night, a party of armed men approached Palmerstown House and knocked on the door. The butler refused to let them in but the men – anti-Treaty guerrillas – barged their way through the servants’ entrance. Bursting into the dining room, they told Lord and Lady Mayo they were going to burn the house in reprisal for the executions of their men that day at the Curragh. They asked the Earl if he was a Free State Senator and he confirmed he was. ‘Are you going to shoot me?’ he asked the man covering him with a service rifle. “No, my lord: we are not going to shoot you, but we have our orders to burn the building.” “It is only right to say”, Lord Mayo recalled, “that the raiders were excessively polite”. The ‘Big House’ or country mansion of the Anglo-Irish landed class, was a target of republicans throughout the Irish revolution of 1919-23. A total of 275 were burned out, blown up or otherwise destroyed between 1920 and 1923. Of these, by far the greatest number, 199, were destroyed, not during the conflict against the British, but in the period of intra-nationalist civil war between 1922-1923. The Irish nationalist narrative had always maintained that the land of Ireland had been stolen from its rightful, native Irish and Catholic, owners by the alien “Protestant Ascendancy” in the 15 and 1600s. Even more deeply ingrained in the popular psyche were the land struggles of the 19th century, aimed first at establishing security for tenant farmers and eventually at a transfer of land ownership from landlord to tenant. In 1914, the Irish Republican Brotherhood’s organ Irish Freedom still wrote of the land system as comprising of, “robbery, fraud and hatred of the people”. Once British protection had been withdrawn, the most radical elements of the nationalist revolution, in the anti-Treaty IRA, took the opportunity to sweep away the symbols of the old order in the countryside. As early as 1918, IRA organiser Ernie O’Malley had his Volunteers train in demesne grounds to, “rid them of their inherent respect for the owners. Even yet their fathers touched their hats to the gentry and the sergeant of the police”. During the confrontation between the British and the IRA in 1919-1921, the Big House was made a target in reprisal for British burning of republicans’ houses. In June 1921, an order to burn loyalist houses in retaliation for British reprisals was issued by IRA GHQ. As a result, the local seat of the Ascendancy was often burned because the republicans assumed that the old landed class were loyalists. 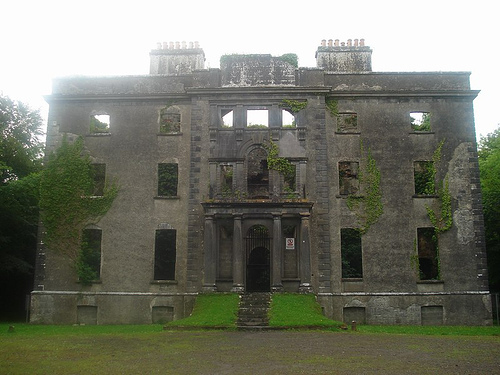 Lord Listowel’s residence Convamore, for instance, was destroyed in April 1921 in retaliation for the destruction of the houses of six republicans and because he was, the attackers alleged, ‘aggressively anti-Irish’. In April 1921, north Cork IRA leader, Liam Lynch, enraged by the destruction of several houses in reprisal for an IRA ambush declared, ‘six big houses and castles of their friends, the Imperialists will go up for this’. The logic behind the burnings was clear; the old Ascendancy class were the backbone of the British presence in Ireland, destroying their palatial seats also hurt the British state, by forcing them to allocate troops and police to protect the gentry and also by undermining the deference some still felt for the old landed families. Republicans seem to have taken gleeful pleasure in demonstrating the equality between the charred remains of their own houses, burned by British forces and those of the ‘castles’ of the ‘imperialists’. However, in 1919-21, the country mansions were generally attacked as specific reprisals, and not made the subject of a concerted campaign as they were in 1922-1923. During the period of civil war between Pro-Treaty (Free State) and Anti-Treaty (Republican) factions in June 1922-April 1923, 199 Big Houses went up in flames – over three times as many as in 1919-1921. There was also a difference in geography from the earlier period. In the civil war, burnings were more common in Leinster than in Munster. In the civil war, the only county in Leinster with no burnings was Laois (then Queens County). Republican commander Con Moloney ordered in July 1922, just after the outbreak of Civil War, that Unionist property should be commandeered to accommodate their men and some Big Houses were destroyed or damaged during the opening phase of the war, in which the Anti-Treaty fighters were driven from their fixed position around the country. Nobles’ houses were also used as billets by both Pro-Treaty and Anti-Treaty forces. Edith Somerville described how on one occasion soldiers ‘used a Rembrandt as dart board’, while the Earl of Ossory stayed in his castle to prevent republicans destroying it and saw it retaken by pro-Treaty forces. Considerable damage was done to the castle in the fighting; paintings were damaged, antiques were destroyed and windows smashed. However the most intense assault on the Big House came in early 1923. By then the anti-Treaty campaign had been reduced to a localised and small-scale guerrilla affair, fought by ever-dwindling bands, coordinated very loosely by a clandestine leadership under Liam Lynch, which Free State forces hunted from safe house to safe house. Ballycarty House, Kerry, destroyed in late 1922. The Minster for Agriculture, Patrick Hogan, wrote to Prime Minister WT Cosgrave; “House Burning [among Anti-Treaty Guerrillas] has become a matter of course”. Why did the Anti-Treatyites embark on a concentrated campaign against the Big House in early 1923? One reason was simply that it was easy to do at a time when their military capability was seeping away. Another, the stated reason, that it was reprisal against the political elite of the Free State for the execution of Republicans. Thirty seven of the houses destroyed were those of Senators, of whom about 20 were old landed families. Less likely also to provoke lethal reprisals from the Government. When Sean Hales TD was gunned down in Dublin in December 1922, the Government immediately had four imprisoned republican leaders shot by firing squad in retaliation. But the campaign against the senators is only a partial explanation of the burnings. Most of the landed class were not senators and some of those burned out – such as Horace Plunkett, – were social reformers and even nationalists of a sort. Another possible explanation for the arson campaign was to drum up popular support in the countryside by attacking and humbling the class who had once been masters of the country. Certainly, much of the rural population had traditionally seen the “landlord” as an oppressive, alien ruling caste and there is little evidence of widespread sympathy for the victims of the campaign. Ardtully Castle, burned in 1922. But at the same time, the campaign was largely limited to violence against property rather than people. There were no massacres of the civilian “enemies of the republic”, no mass graves were filled up, no wholesale displacement either of Free State supporters or of former loyalists took place. There is also, in the accounts of the burnings, a curious air of deference about the guerrillas. Earl Mayo, during the burning of Palmerstown House, thought the raiders were, ‘excessively polite’. Compared to, for instance, the attacks on the homes of the Russian gentry during the revolution of 1917-18, when the Bolsheviks urged the peasantry to, ‘loot the looters’, and the gentry themselves were often beaten or killed, the Irish affair looks almost gentlemanly. As even the likes of IRA leader Ernie O’Malley acknowledged, the actual power of the Ascendancy class was largely a thing of the past by the 1920s. “I cycled past many a broken down demesne wall, once the sign of an entrenched ascendancy, now the symbol of passing order…Virtue and strength was going from the leeches who had sucked life from the people”. The 1903 Wyndham Act had subsidised Irish tenants with British government loans, repayable over 70 years, to buy out their landlords. Whereas in 1870, 97% of land was owned by landlords and 50% by just 750 families, by 1916, 70% of Irish farmers owned their own land. These reforms, which amounted to a peaceful revolution in land-holding in Ireland, took the sting out of the land question and largely explain why there was so little violence against the persons, as opposed to the property of the old landed class in 1919-1923. The civil war of 1922-23 was, for people such as Patrick Hogan, the first Free State Minister for Agriculture, in fact, a contest between ‘order’ and ‘anarchy in the countryside. Kevin O’Higgins, the Minister for Home Affairs, cited over 500 seizures of land by tenant farmers, burning of landlords’ property and a labour dispute in Kildare where shots had been exchanged. There was a great deal of rural class conflict during the civil war but the old Ascendancy class were almost irrelevant to it. 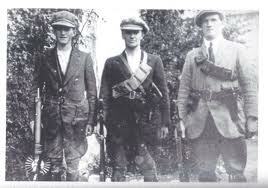 Part of the Free State Army, organized in a “Special Infantry Corps” was used to put down agrarian agitation across the country and a wave of strikes by agricultural labourers across south Leinster and north Munster. The Republicans for their part made some noises about social revolution. Ernie O’Malley approvingly quoted a programme that, “Under the Republic all industry will be controlled by the state for the workers’ and farmers’ benefit…all banks will be operated by the state…the lands of the aristocracy will be seized and divided”. But the Anti-Treaty IRA adopted nothing so radical as their objective. And in reality the “aristocracy” no longer controlled the land anyway. The Republicans never took an active part in the various class struggles that broke out between ranchers and small farmers, or between farmers and labourers – all of whom were predominantly Catholic and nationalist. Instead they concentrated their ire on the mostly defunct Anglo-Irish landed class. Why this was so tells us something important about the Irish revolution, its origins and perceived purpose. Self-government for Ireland, in the form of Home Rule, was already on offer from the British government since 1912 – albeit limited to control of domestic affairs under the Empire. Land reform had already been implemented, though the landed class had been amply compensated. The recourse to arms on behalf of Irish nationalists was essentially about speeding up these processes but also changing their meaning. Ireland would not be a grateful self –governing dominion under the crown, it would be an independent republic. Land redistribution was not an enlightened reform but a partial correction of a historic injustice. The importance of such symbolism – viewed as a kind of correction of history – was what made the Treaty, a backsliding from the Republic where the King of England was head of state and where Ireland was a dominion under the Empire, so hard for many republican activists to accept. The civil war of 1922-23 was in this sense, the Irish ‘Thermidor’ – that stage in a revolution where the more moderate forces step back from the most radical elements and suppress those former comrades who refuse to compromise. The assault on the Big Houses was an attempt to symbolically destroy the colonial past and to show that the revolution was not over. The assault on the Big Houses in early 1923 only makes sense in this context – as the Anti-Treatyites attempt to show that the revolution was not over. That they were determined not to accept a settlement where the likes of Lord Glenavy presided over the Senate and determined to blot out the reminders of what they thought of as the British colonial past. As a military tactic, the burning campaign of early 1923 was inconsequential to the outcome of the Civil War. Ernie O’Malley, by then imprisoned, wrote, “I see the necessity for burning but it does not go hand in hand with fighting; it will eventually react on us”. In the campaign against the British, burning Big Houses may have deterred reprisals against republicans’ homes. In the intra-nationalist phase of the conflict, the Free State forces, who had excellent intelligence on their former comrades, did not have to resort to reprisals against property (revenge killings of republicans were another matter). Burning down the houses of the old landed class made no difference to Free State’s ability to round up and intern anti-Treaty fighters. The revolution’s legacy to the land question, as in many other areas, was profoundly ambiguous. The Pro-Treaty side, inheritors of the moderate revolutionary tradition – conciliatory to Britain, legalistic and socially conservative – not only put down those who wanted to continue the nationalist revolution, they also made peace with the former Ascendancy class. Lord Glenavy, for instance served in the Senate until 1928. Lord Mayo was compensated by the Free State in 1925 for the destruction of his mansion at Palmerstown house to the tune of £15,000. On the other hand, one of the first major acts of the Free State was to set up a Land Commission for the compulsory purchase of land, “for the purpose of relieving congestion”, in order to drain the remaining venom from the land question. And when the Cumann na nGaedheal had to decide in 1930 on what qualified as a National Monument, to be afforded state protection, the Big Houses were specifically excluded. As for the republicans, once they entered power by democratic means in 1932, they set about recreating the Irish state in their own image. The Senate, with its grandee representatives was abolished. Land annuities, repayments to the British government for the land reforms of the early 20th century, were stopped. Eventually around 10% of the money owed was paid as a final settlement in 1938. Today, in a very different Ireland, the power of the Big House, even as a symbol, is largely gone. In Mayo there is a campaign to restore Moore Hall, burned out in February 1923, as a cultural site and tourist attraction. We have, perhaps, come full circle. See also the follow up article The Burning of the Big Houses revisited 1920-1923. Cited in Litton, Helen, Illustrated History of the Irish Civil War, p113 Wolfhound Press, 1995, p113. Written by: John_Dorney on 21 June, 2011.on 12 October, 2017. 28 Responses to "The Big House and the Irish Revolution"
Good to see there’s moves to utilise Moore Hall for tourism. Was on holiday in Mayo last year and me and the lads stumbled onto it completely by accident. It’s an incredible bulding. The inside is completely gutted but the edifice is completely intact. Utterly massive and beautiful and with a great history behind it. The main problem with a restoration would be the fact that there’s a colony of rare protected bats roosting in it. Might be better to leave it as it is, maintain what’s there and advertise the place a bit more. My grandfather had the dubious joy of digging tank traps for a Republican Flying Column. His wife had the task of lodging and feeding 16 hungry young men who were well up for a ruck. Dinner was served to all. Happy days. It beat paying tax to the Brits! Next time out, if there ever is one, we will have adopted NRA principles. An armed population has a better chance of being a free population. As an Englishman with a wide knowledge of Ireland,its people and its history, I am much saddened that the Irish are such a vindictive and vengeful people with a unending capacity to bear evil grudges. Your cultural history is proof positive that you are capable of giving much fine literature and poetry to the World. Why sully this with a hatred born from events many, many years ago ? Live and let live and move on ! A common conceit. Most Irish people, ‘moved on’, long ago. This is a history website however so we do tend to talk about the past. Its a bit of both sides really. You are taking things a little too personal, and there will always be die-hards for every cause. Look at the national front, the hooligans and so on in Britain. Don’t you worry at all. As soon as you are in an Irish environment, they will look after you. The negative rhetoric of a few will always linger on, it is in the nature of some humans minds that cannot cope with an ever growing, more evil threat than an occupation. The world crisis today demands that we see more clearly and defined who the enemy of the common people is. It is not the English (for the Irish) the Germans (for the English) the Russians (for the Germans), nor is it the Taliban for the Americans. It is a network we can no longer see or battle against. Therefore, a few disgruntled people, unimaginitive and backward, in the sense of not going forward, will always look for the easy way out. As did the growing empire of England in the seventeenth century, as a few Irish are doing today. But I stress the words ‘a few’, for the majority of us know that it was a system that lead the poor into the traps on both sides of the Irish sea, as the SS of Germany were able to control one of the greatest cultural nations of Europe. Relax, go and have a pint in Ireland and I bet you will not be long alone at the bar. Hi Donal O’Brien,my name is Tony Farrell,I live in NZ,my Dad Archibald Edmund Joseph Farrell passed away 26/8/17 aged 97, his father was Capt Cecil Joseph Farrell,buried at Moynalty cemetery,they lived and owned Enniscoffey,a house at Bog Road,Milltownpass,Mullingar,I have the only photos of Enniscoffey I think?,do you know anything about it,I know quite a bit about the house from my father who lived there,and Father Val Farrell has been to the site where the house used to be. Regards Tony. My former home, Red Hill in Co. Sligo, escaped these burnings in a rather interesting way. By 1919 there was only a single spinster left of the original family. She deeded the house over to her outside man and house keeper on the conditions they marry and she be allowed to live in the house until her death. The articles in the local paper explain jubilant celebrations composed of crossroad dances and bonfires. Although her two closest affluent neighbors were burned out, she lived on in her home and enjoyed the respect and protection of the community for the rest of her life. Fascinating. 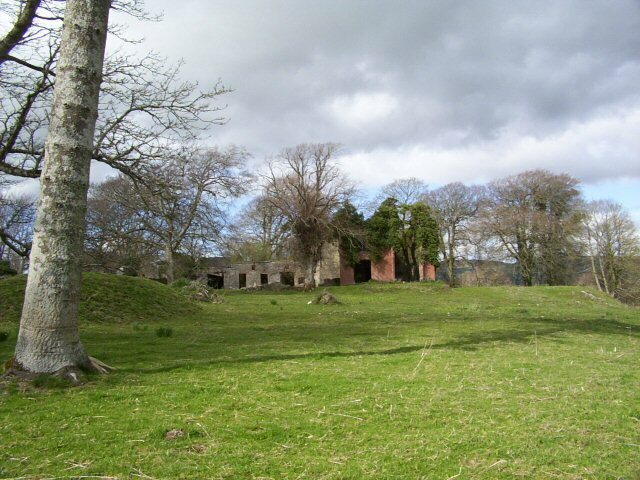 I was browsing a site on abandoned Irish mansions and was amazed at how many homes were burned by the IRA. Cool to learn the history behind it all. Thank you for this article. It’s by far the best summary, and most eloquently written, of these events that I have come across. I enjoyed this article very much. Up to date and informative. You mention that County Laois was spared any burnings. Is this significant in any way? I don’t think so except that Laois was not particularly violent in the Civil War anyway. But it might also have something to do with teh relative popularity of the gentry there? But you’d have to look closer to confirm that kind of conclusion. So they were going to burn “Lord Mayo’s” house down and they still referred to him as “my lord”. Odd that. I wonder did they doff their hats as they left? Hi John, great article, well nuanced presentation of that period. 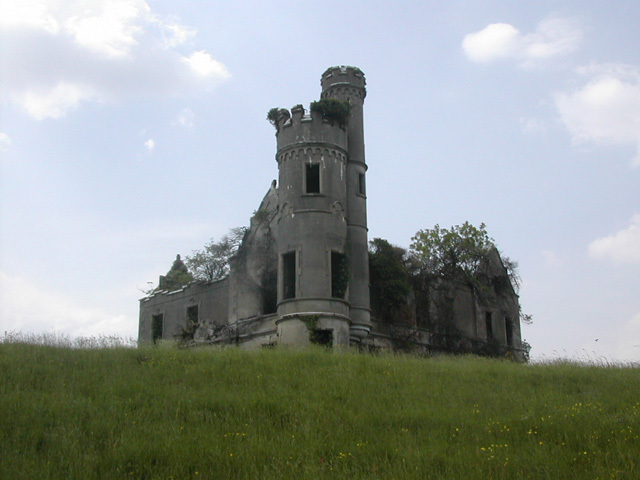 Did you ever come across Screggan Manor just outside Tullamore? It seems to have been burned during this period. Hi Marie, no I don’t think I came across that one but I’ll have a look and see what I can find. Patrick Campbell (‘Me train!’ etc) was the grandson of James Campbell, Lord Glenavy, not his son. He was 9 years of age at the time the house in Kimmage was burned. As for Lord Glenavy, given that he died in 1931, and retired in 1928, he was certainly not still chairing the IFS Senate in 1936. Thomas Westropp Bennett was the last chairman. I would strongly dispute your claim that ‘the campaign was largely limited to violence against property rather than people’. Tell that to Kevin O’Higgins who saw his father murdered & his (father’s) relatively modest home burned. ‘Buried Lives: The Protestants of Southern Ireland’ by Robin Bury also outlines, in greater detail, how a concerted campaign to drive these ‘enemies of Ireland’ was mounted. Peter Hart’s works on the IRA and those of David Fitzpatrick and William Sheehan also pops the collective southern amnesia/omerta. IRA murder gangs always claim their victims are informers/spies etc relaying such propaganda as fact and implicit justification is unhistorical and distasteful (second article’s reference to three supposed informers in Blessington). You note the widespread looting of the big houses which were burned. If reprisal was the aim, as claimed, why not burn the furniture and contents as well? Theft was the aim, as with cattle driving and land grabbing, and unreasoning hate the motivation. In the 1950s and 1960s it was commonplace to see ornate marble fireplaces and expensive furniture well beyond their apparent means coming up for auction when ex IRA men died. Looted for the republic? The fact that most house burnings took place when the anti-Treaty terrorists were losing, indicates that this was ‘revenge’ on available targets, just as the Nazis decided to take genocidal action against the Jews as it became clear they were losing World War 2. There is ample documented evidence that Liam Lynch et al were bent on killing and driving out all those they deemed members of the ‘enemy civilian garrison’. That they were not able to do this completely is down to the Free State forces, supported by the UK, killing or interning them first.